“He wanted to be a musician, but his father promised him a thaler (dollar) a week to study theology.” These and other personal and historical curiosities came to light as Rev. Jon Vieker and Dr. Thomas Winger explained the role of C. F. W. Walther (25.10.1811–07.05.1887), the first president of the Lutheran Church–Missouri Synod, in preparing a sound Lutheran hymnal and agenda designed to reverse a trend of less musical and less orthodox worship materials. Pastor Vieker presented a brief history of German hymnals and hymnody to participants at the C. F. W. Walther Festive Convocation held Sunday and Monday, 23 and 24 October, at Concordia Lutheran Theological Seminary, in honour of the 200th anniversary of Walther’s birth. The event began with a narrative hymn-sing Sunday evening with 79 in attendance. The Resurrection Lutheran Church Choir, under the direction of Dianne Humann, assisted as the group sang hymns from the entire church year. On Monday Rev. Vieker began by pointing out the large variety of hymnals from various state churches that made worship challenging for the Saxon immigrants seeking religious freedom in America. It was Walther’s congregation, Holy Trinity in St. Louis, which decided to prepare a new hymnal, and Pastor Walther was appointed chief editor. Thus the 36 participants gathered in the chapel and the 102 participants logged in online learned that Walther was highly influential in providing worship materials as well as in theological writings and political leadership for the new, struggling Synod of Missouri, Ohio and other states. Dr. Winger led us through a study of Walther’s five hymns, written on a long sea voyage to Germany in 1860. Trying to sing them was a lesson in how voices and music have changed over the years and across the ocean. He also provided a brief history of the development of the German Lutheran Agenda. Both the Agenda and Walther’s German hymnal edition were still in use over a hundred years later in some LCC and LCMS congregations. Following a German-style luncheon prepared by staff and volunteers, Rev. Vieker presented some of the challenges of transitioning from an all-German to a more English synod and hymnal. 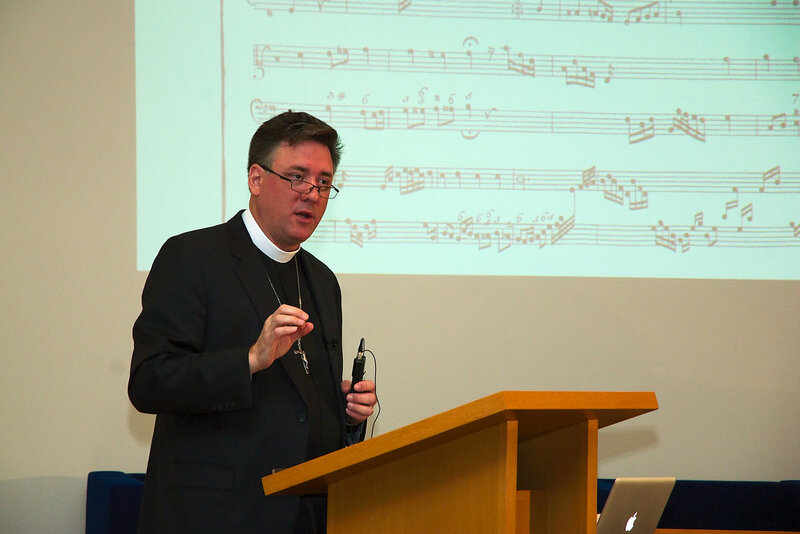 for the Promotion of Lutheran Liturgics and Music. Note: Video recordings of the presentations were made, but are not yet available. The links will be sent when they are ready. C. F. W. Walther Festive Convocation: Watch Live!